I have tried a lot of scrubs for my face but never bought a body scrub. I use a loofah while bathing so never felt the need for a body scrub. However, when I came across this body polish at one of The Body Shop outlets, I thought of giving it a try. I was in a fix as I could not decide between their Satsuma Body Polish and Strawberry Body Polish. I ended up buying the Strawberry Body Polish because it was the last piece left and I thought perhaps it is a popular product. I am glad I tried this body polish because it worked well for me. I have been using this body polish twice a week for two months and here is my experience using it. 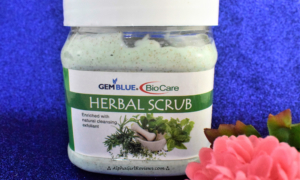 The gel scrub gently exfoliates dead skin cells and leaves the skin soft and smooth. Squeeze out the required amount of the gel scrub onto palm and gently rub over your entire body (except face) and then wash it off with regular or lukewarm water. The body polish comes in a transparent plastic tube with a flip cap. The granules in the scrub are smooth and mild on the skin. Kiwi seeds present in the scrub also help to exfoliate the skin gently. I used the scrub with and without a loofah, which did not make much of a difference as a small amount is enough to scrub a full arm. However, I would advise to use it without a loofah because the granules and kiwi seeds tend to get stuck and it is difficult to wash them off the loofah. The scrub is gentle and is easily washed off. The skin does not feel slimy after washing like it does with a lot of other body washes. Also, the scrub smells strongly of strawberry and the fragrance lingers for more than an hour after a bath. I am happy with this product as it fulfilled its claim. My only concern is a number of chemicals used in the body polish. Other than that nothing bothers me. I give The Body Shop Strawberry Body Polish 4 out of 5 rating. The body polish does pinch the pocket but fulfils its claims. If you do not mind spending on bath products then you can try this one. It is not a necessity but a luxury product you can use when you want to pamper yourself.